Set out to follow the Orange Trail today, expecting to ride out for two hours then ride back. After about the first hour, though, we came across a section where it was like a swamp for more than a quarter mile, knee deep with no way around. Hubby tried to get around one section and ended up up to his knees in mud as his mare sank into the mire. He managed to get her back on the trail, and we almost turned around at that point, but finally we broke through to higher ground, and had quite a few miles that were dry or almost dry. We decided we didn’t want to go back that way, so we were committed to doing the entire Orange Trail, a loop that was more than 18 miles long. At least it was mostly flat, which made it a lot easier than Kisatchie’s 20 miles last Saturday, so the horses (and we) didn’t get nearly as tired. I’m certain that with a few weeks of dry weather, this would be a truly magnificent trail ride. Arrived back about 5:30, washed off the mud, gave the horses a good portion of oats and hay, then finally crashed for the evening. A fantastic day! Spent the day working on updating our business home page, and a little bit of bookkeeping, while resting up for another big ride tomorrow. We took some time to look at the map here as well, and have decided the trail lengths are only for the part of the colored trail that’s marked on it’s own, and not the parts that overlap, which means that to take the blue trail (11.65 miles) from the Piney Creek horse camp, you need to add another mile, and to take the green trail (5.56 miles), you need to add another 10 miles just to get to it. 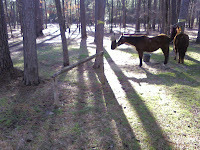 There is another horse camp/trailhead by the green trail, but it doesn’t have water for the RV. Haven’t decided which one to do yet, depends on what time we get out tomorrow, and what the weather’s like. Have to wait and see! After Hubby ran into town to fill up the generator gas cans and a quick lunch, we saddled up and headed out. 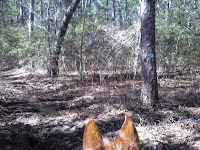 We found the trailhead, and began on the orange trail (see pic). This forest is a much wilder, more natural forest than the more managed ones we’d been to earlier (though Kisatchie last week was pretty natural in some spots, too), and the trails were mostly dirt, pine needles and leaves. There was a lot of water on the trails from all the rain and snow they’ve had here recently, but overall the footing was pretty good. The mud was more of a nuisance than an obstacle, whereas at Kisatchie the mud was treacherous in some places. Very easy trails, almost completely flat, but pretty well-marked. My only question on the trail map was whether the distances were just that trail, or did it include the trail that led to the trail as well? In reality, some trails were marked two colors (like blue and orange, and later, blue and white), but on the map there was no overlap. Guess we’ll find out more on Saturday when we ride again. The only down side besides all the water was that this forest is more of a patchwork than one solid piece of real estate. 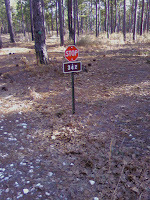 The trails all manage to stay on Forest land, but cross several roads and border many pieces of private property. Traffic is a bit more active on those roads than one would expect, so the “escape to the wilderness” effect just isn’t quite there. The camground is quiet enough, though the local sheriff drove around it last night, and we had a nice chat. A bit pricier than some of the other camps we’ve been in ($10 for the 1st vehicle, $3 for the second per day), but that seems to be the case in all of the Texas Forests, and the State Parks are even more expensive. We’ll just have to make up for it by staying longer in the $3 parks! Good cell phone signal here, though! Woke up to the alarm at 7:00 am, was packed up and on the road by just after 9:30. The drive was a straight shot across country, due west, on some of the worst roads we’ve ever seen until we hit the Texas border. A patchwork of asphalt patches and potholes kept us bouncing around for the first half of the trip. Went to an RV place in Lufkin to 1) buy propane, which they didn’t have, 2) look for a new door handle for our patio sliding door, which they didn’t have, and 3) dump, which, by now we were so discouraged we forgot to ask. The man there did give us directions to the nearest propane place a few miles up the road, and we filled up for just $18/tank, the cheapest we’ve found since we left home. Then we found a gas station (though we forgot to fill the spare tanks for the generator 🙁 , and a Subway for lunch. We dumped at the regular campground at the forest, then traveled out to the horse camp, only to discover a sign on the kiosk saying “No water, sorry for the inconvience (sic).” I’d been on the phone with these folks trying to get answers to several questions for several days, and had yet to get those answers, except for the one about “Is there water?”, to which they had definitively answered “Yes.” I immediately called the District Office, and to which they responded, yes, they have water, it’s just been turned off because of the cold weather (two snowstorms in three weeks, apparently unprecedented for the area.) They thought a burst line had been fixed, and would send someone out to turn the water on. Sure enough, within 30 minutes, two women arrived to do just that, and we were in business. Meanwhile, we got the horses highlined, waited until we were sure we had water before we opened up the RV, and were all settled in by 5:00 or so. Of course, the pic is our new back yard! Spent the day doing paperwork and resting up a bit, we have such a busy few weeks ahead we thought we’d try to store up on some rest. Read a Clive Cussler adventure for most of the afternoon before starting our evening early, watching a movie and some Olympics. Started raining late in the afternoon, and the forecast was for the temps to go below freezing, so just before bed we put the horses in the trailer for warmth. We also decided that since the next two days were going to be sunny, and rain was forecast for Friday, that we’d go ahead and leave in the morning, so that we could ride in a new, warmer, place on Thursday. Love it when plans can be this flexible! Spent a little more time nailing down where we plan on keeping the horses in Austin, now the decision is between just two places, then took a short, two-hour ride on the southern loop of the Sandstone Trail, just enough to loosen everyone up a bit. Weather getting progressively colder, forecast is for rain/snow mix and lows in the 30’s. Hooked up the trailer just in case we decided to put the horses in later. Also spend some time working with Hubby on some script changes he wanted to make for an upcoming performance. Looking forward to a quiet, relaxing evening, maybe watching some Olympics. Both of us woke up stiff this morning (not surprisingly), but I made pancakes and eggs to comfort our aches. It was decided that we needed to go shopping, having made the decision to stay until Thursday, so I hopped into the truck and ran into Natchitoches, LA, found the Wal-Mart, and stocked up on everything, including gas for the generator and a new tarp to cover the hay. Now I fully intend to relax the rest of the day! In addition to Tom and Gloria arriving last night, more folks arrived early this morning, and most were out on the trail by just after 10:00. We followed suit by about 10:30, and headed out on the Sandstone Trail. We decided to take the shorter loop (15 miles, according to the lady at the ranger station), going counter clockwise, with a brief stop in the middle. What a GREAT ride! Trails were a bit muddy in some spots, and really torn up by the ATVer’s (who are supposed to be banned at the moment, but that doesn’t seem to be working), but the variation in terrain, with some sandy flats, some mountain climbing and descending, lots of different kinds of trees, by far the most interesting trail we’ve been on in a long time. Trails are well marked, too, and they even have mile markers every mile, though not necessary in the direction we were going. It seems the trail is a little more than 15 miles, and the trail from the campground to the cutaway trail is another 4+ miles, so in the end, we figured we did almost twenty miles in the end. The horses did great, though they were obviously tired the last few miles, as were we. They got a great oats reward when we got back at 5:30, with a half hour of light left to get everyone settled. Then I walked over the Tom and Gloria’s site to return a bottle of wine (which we thought we’d be back in time to share, but it was a bit late now), and had a can of beer with them instead. Meanwhile, Hubby befriended the other campers that arrived in the morning, Greg and Lorilee. Greg is from England, too (as is Hubby), so they chatted about the state of things in the world. Finally got back, made a meal, then crashed into bed, with muscles that knew they’d had a workout! A fabulous day! Ran out to the quail area for a few hours to work online and make phone calls getting information about our next stops in forests and the stables in Austin. When I got back, Hubby was still working on the horse trailer lights, so I gave him a hand with that for a while, until he finally managed to get it fixed. Just some corroded connections and loose wires in the end. After some discussion about what I found out about our next stops, we decided that rather than put two more stops in, we’d stay here until probably Thursday, then head out to Davy Crockett National Forest in Texas, where they have a horse camp with central water and campsites suitable for Rvs. Later in the day, a couple that had arrived last night, Tom and Gloria, stopped by on their way back from a ride, and we invited them over for cocktail hour later in the day, which they did, and we had a lovely chat over a few glasses of wine. He’s a semi-retired arborist, and they have dreams of horse camping full time in a few years. Very enjoyable evening. Going to be a busy time after next week, so we need to get in all the recreation we can before that happens! Thursday, February 18, 2010 – Got it right today! Ran up to the quail area for a bit of work, sent a bunch of emails trying to find a place in Austin where we can board the horses while we fly to DC, and answering some other emails and phone calls. 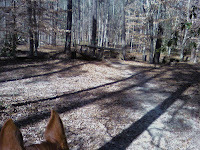 Got back by noon, grabbed some lunch, saddled up and had a FABULOUS ride. The trails were a bit rough in spots (there had obviously been some ATV traffic, despite the current ban on it as they try to restore the trail), but most of it was very nice. More hills than we’ve seen in a while, gave the horses a good workout. The forest trails are true trails, and the roads here are mostly hard-packed sand with some chattahoochee-type gravel, so it was great footing. We only hit one spot toward the end that someone had put down a bunch of really large obnoxious gravel, but it didn’t last long, fortunately, and it was a shortcut anyway, so we’ll avoid it in the future if possible. Coming up to a road crossing from a trail, we saw the cutest little stop sign at the edge of the road, and they even had a “stop ahead” sign before that! Very cute, never saw that before! Also, there were a number of bridges across some streams that added a bit of variety as well. The main trail has two loops, one is 15 miles and the other about 30, but both have lots of forest roads cutting in and out, so you can create your own path. Really nice mixed woods, with pines and deciduous, and even a ring of bamboo around the camp (why they call it Cane Camp, Hubby thinks). Great day!